There is still time to be a featured Sponsor for this year's Love Thy Neighbor event. If you, your company, or a colleague's business have an interest in proudly partnering with us, please join us for our next Sponsorship Reception on September 16 at 6:30pm at Anne Neilson Fine Art gallery. Sponsorship levels begin at $1000. RSVP is necessary. Contact Brooke Fleming to be added to the guest list or to request a sponsorship packet. A sponsorship commitment by September 20 will ensure that your logo or name will be included in Love Thy Neighbor marketing and event materials. A special thank you goes out to SunCap Property Group for being our 2014 Love Thy Neighbor "Angel" again this year! Keep in touch with all the happenings of The Harvest Center of Charlotte on Facebook, Twitter and Instagram. Click the icons below to visit each page, and we look forward to connecting! I am honored to present to you our third graduating class for 2014! 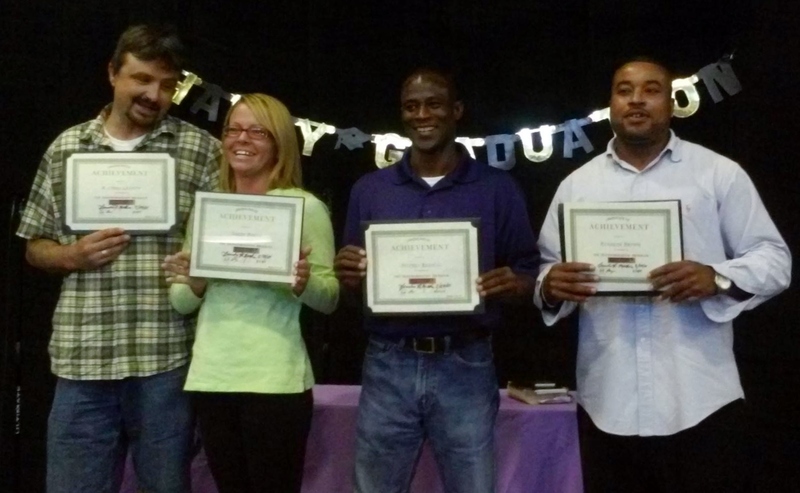 Chris, Sarah, Jeffrey, and Kenny (pictured left to right) have successfully completed phases one and two of the Transformation Program. Our star graduate is Sarah: Sarah completed the normal 6 month track in just 5 months due to her perseverance, renewed esteem and faith in God! She has been a light in our program and has a bright future ahead. Sarah had a great start in our program as a transfer from the Dove’s Nest. Special thanks to Reverend Marciano for his partnership and invaluable friendship.Chris and Sarah will move on to permanent housing with friends and family and Kenny and Jeffrey have been promoted to our extended phase, which will allow them 6 additional months of housing and community care. All of our graduates will receive 6 months of follow up and aftercare as needed, thanks to the continued financial support of our donors! My favorite part is that ALL of our graduates are employed full time with an average wage of $10.00/hour! Think of what that means considering that when they came to us they were homeless, unemployed and did not have a plan to turn their lives around! To God be The Glory for the things He has done! Please plan to join us in congratulating each of them, as representatives of the great work we have been commissioned to do, at our Love Thy Neighbor event on October 28 at the Knight Theatre. It is with great excitement that The Harvest Center of Charlotte announces our "Double the Harvest" Gift Matching Campaign! 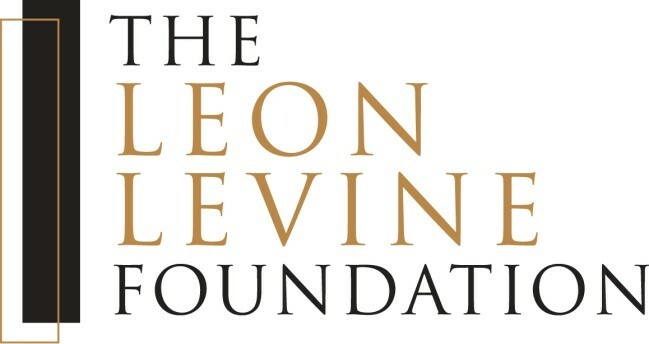 We are so thankful to The Leon Levine Foundation for their partnership and recent grant of $30,000! In order to inspire more of our friends to support our life-changing work, $10,000 of this gift must be matched, dollar for dollar, by December 31, 2014.
by homelessness, unemployment, and poverty. We work to see their lives transformed through the love and ministry of Jesus Christ. Click here to DOUBLE YOUR GIFT today! Partners like you and The Leon Levine Foundation make it possible for us to continue providing over 40,000 hot meals per year, weekly educational and life skills classes, job training and networking, transitional housing, and spiritual guidance to those coming through our doors. Let's Double the Harvest together! We are excited to remind you about Love Thy Neighbor, our annual fundraising event for The Harvest Center of Charlotte. The event will take place on Tuesday, October 28, from 6-9 p.m. at the Knight Theater in Uptown Charlotte. Details on how to RSVP for the event will be sent out shortly. We are also thrilled to announce that four-time GRAMMY® nominated Christian Songwriter/Artist of the Year, Matthew West will be our host and musical guest! Our speaker will be Carey Casey, CEO of the National Center for Fathering. We are honored to have Mr. Casey be a part of this special night. If you are interested in being a host or volunteering for Love Thy Neighbor, please email Brooke Fleming. Please visit our website at www.theharvestcenter.org. Donate to our cause at www.theharvestcenter.org/donate.